I fell in love with this dress as soon as I tried it on! It's elegant, unique and extremely comfortable to wear and dance all night in. It's a lightweight dress with an underskirt perfect for a summer wedding and the small train has a wrist strap fitted. 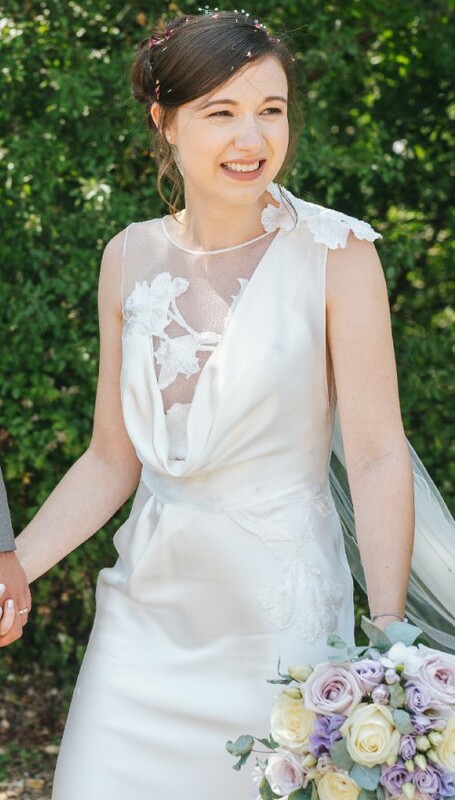 The dress has been dry cleaned by a bridal dry cleaning specialist, unfortunately there is a small snag on the back as shown in the last picture. It's a size 12 dress but I'm normally a size 8 height 5ft3. The only alteration done was to reduce the length and also take in a little on the shoulders. I also had a wrist strap added to the train to be picked up while dancing.